Real Madrid are prepared to make a formal approach to sign Sadio Mane this summer, should the Senegalese seek to push through an exit from Liverpool. Real Madrid reportedly urged Eden Hazard to push through an exit from Chelsea in the summer, given they are unlikely to match the Blues' £100m asking price for his signature. Liverpool are reportedly pondering over a move for Thorgan Hazard after knowing that Borussia Monchengladbach are prepared to sell the ex-Chelsea graduate in the summer. Real Madrid are reportedly confident of securing a big-money transfer for Chelsea's Eden Hazard when the transfer window reopens in the summer. Chelsea will be aiming to secure a third league victory on the bounce when they entertain West Ham United at Stamford Bridge on Monday night. 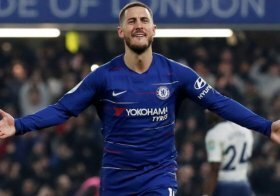 Chelsea are prepared to part ways with Real Madrid target Eden Hazard, provided the Spanish giants are prepared to make a £100m plus bid for the Belgian winger. Chelsea will be aiming to secure a second league win on the bounce when they entertain Brighton & Hove Albion at Stamford Bridge on Wednesday night.